When I first went to London 11 years ago, I was fascinated by its beauty, liveliness, cultural diversity and rich history. I’ve since made many more trips there, each time learning more about — and discovering more of — the UK’s storied capital. With its wide variety of free museums, unique shops and consistently vibrant atmosphere, London is a fantastic destination for travelers of all ages. Despite its fast pace, the level of safety and excellent public transportation system make it among the most youth-friendly places to visit. Here are a few experiences and activities I’d recommend to any teen visitor. Shoreditch, located in East London, is my favorite neighborhood. This hip and artsy community is home to restaurants, stores and some of the best street art in the city. Right next to the Shoreditch High Street station on the London Overground is Boxpark, a collection of one-off popup shops and cafés inside old shipping containers that’s a fun place to explore. Head down the street to Brick Lane and go shopping for fantastic vintage clothes at Rokit and passion fruit chocolates at Dark Sugars. 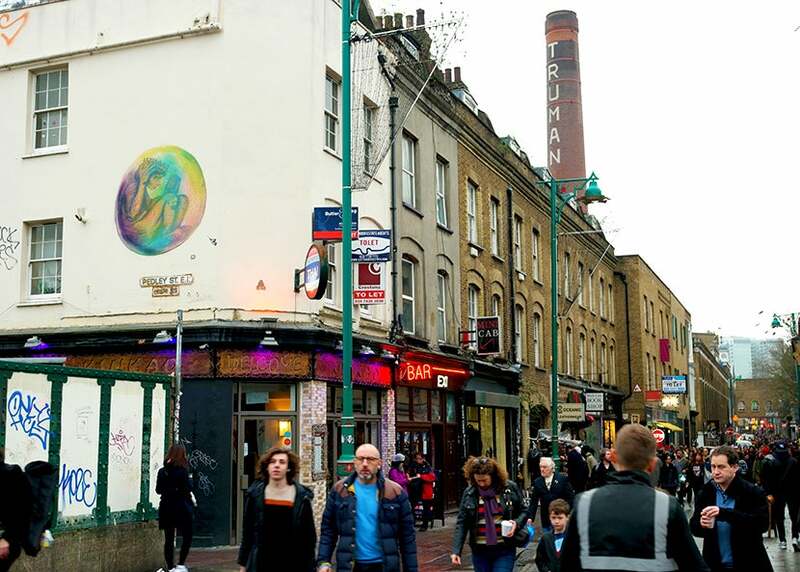 Don’t miss the Brick Lane Market each Sunday, when local vendors spill into the streets and Truman Brewery fills with food vendors selling Burmese, Chinese and Singaporean cuisine — Indian food in this neighborhood is also some of the best outside India. Brick Lane comes alive every Sunday morning with its bustling market. Image by the author. If you want to get away from the intense atmosphere of Piccadilly and Oxford Street, head across the Thames to Southwark, an ancient borough of London dating back to Roman times. 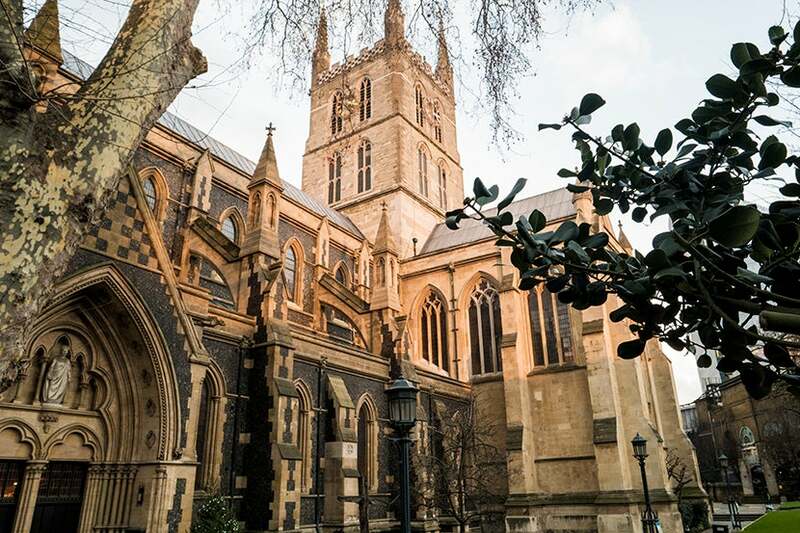 The impressive Southwark Cathedral, a neighborhood icon, has a thousand-year-old history and is definitely worth a visit. Inside the magnificent Southwark Cathedral. Be sure to have scones in the Refectory. Image by the author. Next door is the equally old Borough Market, an excellent food market that’s been held since the year 1014. Visit year-round for inexpensive and authentic Ethiopian, Indian and contemporary English cuisine. The neighborhood lies in the shadow of The Shard, Britain’s tallest building at over 1,000 feet tall . Its observation deck offers sweeping views of London in its entirety. Bring a jacket, though — the top floor is open-air and it gets windy up there! 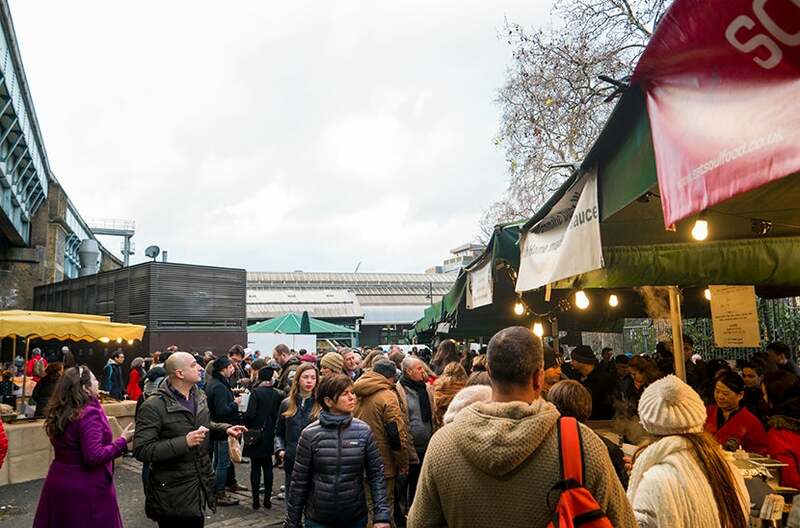 Borough Market is home to some of London’s best street food. Image by the author. While you’re in Southwark, be sure to walk along the Thames to Shakespeare’s Globe Theatre, a modern reconstruction of the original built in 1599. Faithful to its predecessor, the Globe still puts on Shakespearean plays almost every day. A seat will set you back £20-£45 (~$25-$56; £3 or $4 off for minors), but the best way to experience a play at the Globe is to get standing room tickets. At £5 (or ~$6), they’re a steal, and bring you within a few feet of the actors — I got to see Antony and Cleopatra there that way, and the performers even interacted with the audience! Of course, after three hours of standing, my legs were killing me, but it was absolutely worth it. 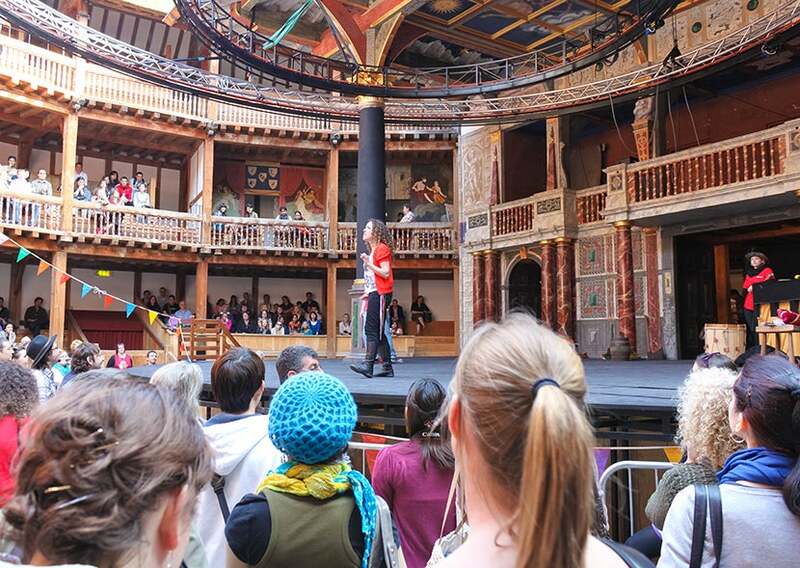 Standing room tickets at the Globe will bring you up close with the actors. Image courtesy of Shutterstock. If it’s your first time here, scope out the city early on in your visit so you can get a feel of the atmosphere. One easy way to do this on a budget is to take a double-decker bus around town, which only costs £1.50 (~$1.86) or £2.60 ($3.23) if you aren’t paying with a refillable Oyster card. Many routes, like 15 and 9 (my favorite), will take you past sights like the Tower of London, Piccadilly Circus and Westminster Abbey. Be sure to ride on the upper deck and step off from the lower deck when you like what you see. If riding a bus doesn’t appeal to you, you can also tour the town from the Thames, the river that gave rise to London and remains its vital artery. 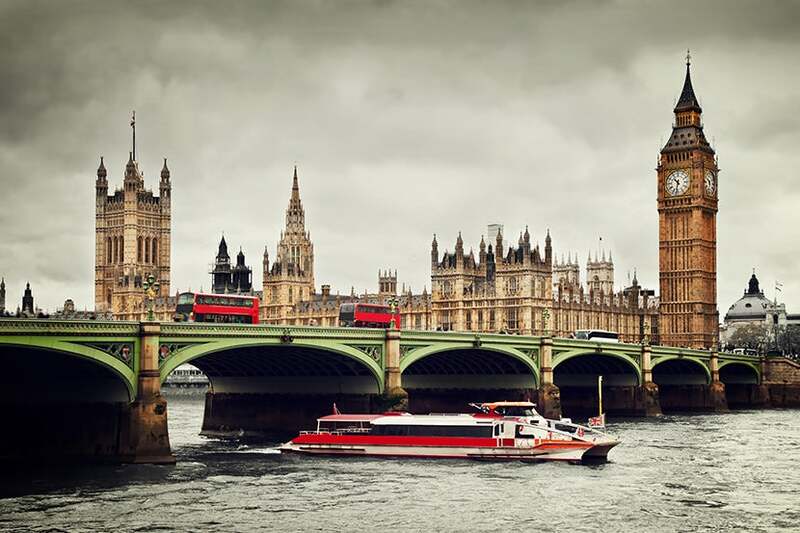 Catch the River Bus boat from many London piers for fantastic views of London’s riverside attractions, including Big Ben, Tower Bridge and the London Eye. A quick side note about Oyster cards: save yourself some time and money by buying one on your first day in town, as the £5 (~$6) deposit will get you discounts on every kind of London public transport. Using an Oyster card is faster and cheaper than using paper tickets, and when you leave town, you can even turn it in and get your deposit refunded. Or if you’re coming back, keep it for next time — it’ll never expire! It’s fun and easy to tour London by bus or boat. Image courtesy of Shutterstock. 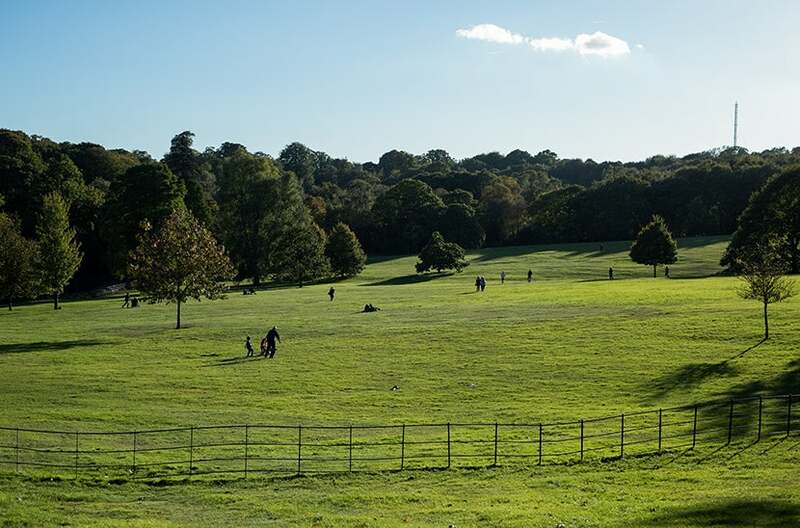 London is home to some fantastic green spaces, like Hyde Park and Green Park, but none offers an escape from the city quite like Hampstead Heath. This vast park, located along the northern outskirts, is conveniently accessible by the London Overground. While few tourists make the trip out, locals love Hampstead Heath’s decidedly rural atmosphere, and because the entire park is at an elevation, there are several lookout points with fantastic views of the city. Hampstead Heath might not feel like London, but it’s just minutes from the city center. Image courtesy of Shutterstock. This walking route, my favorite in London, takes you through some of the city’s most famous sights. Start in Trafalgar Square, home to the National Gallery, which is definitely worth a visit — and is free to enter. Just across the street is St. Martin-in-the-Fields, a gorgeous 18th-century church where you can eat in the crypt’s café — just try not to think about the bodies buried in the floor! Head down the scenic Strand, Britain’s most famous avenue and home to the famed Savoy Hotel, the Courtauld Gallery and the flagship store of Twinings Tea. Turn left at Southampton Street and head straight until you get to Covent Garden. There, visit the fascinating Transit Museum (don’t forget to check out the gift shop), the Royal Opera House and the converted vegetable market, which now hosts various restaurants and shops, in the center of the square. 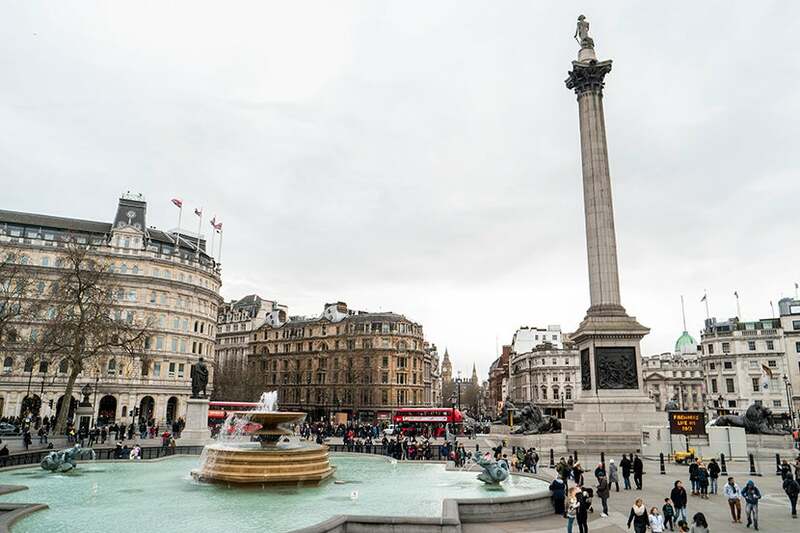 Trafalgar Square is the bustling epicenter of Central London. Image by the author. A trip to London wouldn’t be complete without at least one afternoon tea and, lucky for you, there are hundreds of restaurants and cafés in the city offering the quintessentially British meal of fresh tea, finger sandwiches, pastries and scones. If you can convince your parents to splurge, tea at the Savoy Hotel’s Thames Foyer can’t be beat — the tea is bottomless and you’ll even get free refills on the pastries and sandwiches! A less expensive favorite of mine is at the Kensington Orangery, part of a palace that’s home to the British Royal Family, where tea is served with a lovely view of Kensington Gardens. 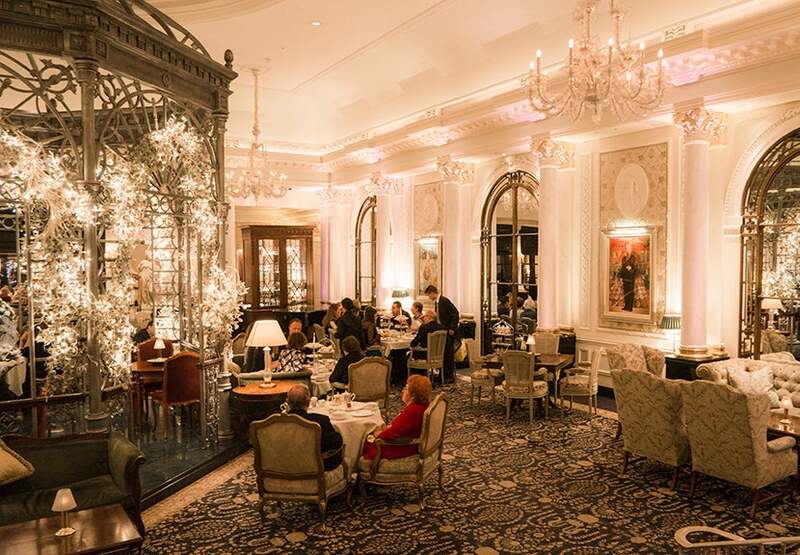 Afternoon tea in the Savoy Hotel’s Thames Foyer is a luxurious treat. Image by the author. Every time I’ve visited London, I’ve been dazzled by something new. There’s no single right way to explore this city of nearly nine million. The UK’s capital has many sides — it is at once traditional and cosmopolitan, ancient and modern. London is a living, breathing story, one that gladly invites travelers to stroll through its pages. You really can’t go wrong here, so pick a Tube stop, go there and spend an afternoon exploring. What are your favorite things to do in London? Leave your tips in the comments below. Visit Kofi’s travel blog and photo blog to follow along with his travels.